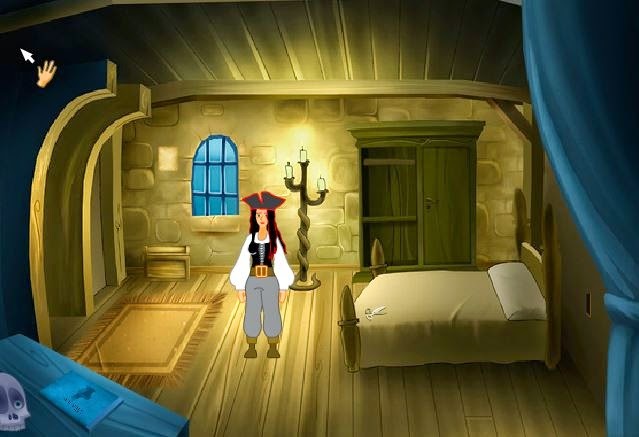 This is the full step-by-step walkthrough solution to help you solve the windows adventure point-and-click room escape game: The Ballad of Ketinetto, episode 10. If you need help or more detailed explanations, then use the comments section below. 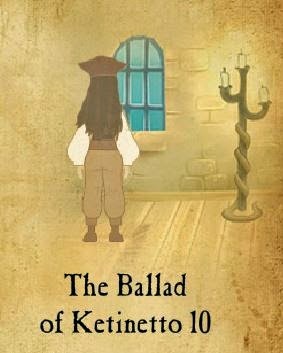 You can play the Ballad of Ketinetto 10 here. 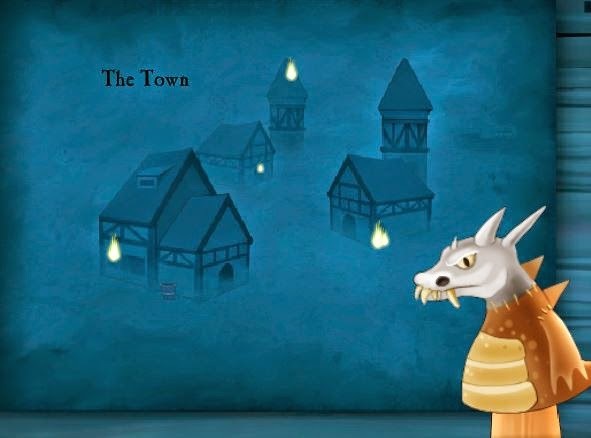 This is a medium difficult escape game and can take you around an hour to complete. This is a very good escape game. Look at the book, then take the needle & thread from the top corner. Notice the book was written by drerd. --> You will have a different name. See the last word in the book (c) ???? --> you will use this name later. Read the note next to the window. hand moon eye sun water fire. Zoom in on the chest and set the images to write the name you saw at the end of the book. Mine was drerd. 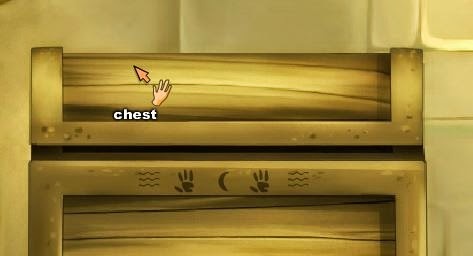 Click the chest more to get 2 puppets. Break the top shelf of the cupboard to get a piece of wood. Use the piece of wood on the loose plank bottom left. Use the small key top open the closet door. Combine the gauge with the big candle. You will make a puppet head. Combine the scissors and the scarf to make puppet clothing. Combine the puppet clothing with the puppet head. You will have a disjointed puppet. Combine the needle & thread with the disjointed puppet. You will get a puppet. You now have 4 puppets. 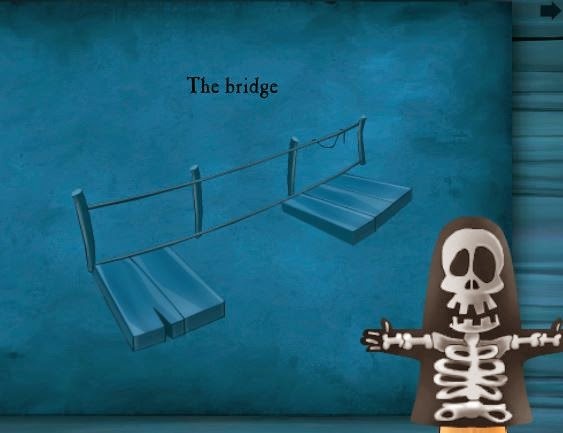 At the bridge, use the Amber puppet to talk to the skeleton. Click the skeleton and he will give you a bone. Combine the bone with the wooden plank. Take the rope from the bridge. Combine the rope with the bone-and-plank to make a hammer. Use the Amber puppet on the puppet. You need to kill the flames. Take the pail from the bottom left house. Put the pail down under the leaking roof. If you do not know where, do the next step to make some drops. Use the hammer on the leaking roof to fill the pail. Take the pail with water. Use the pail with water to kill all the flames. 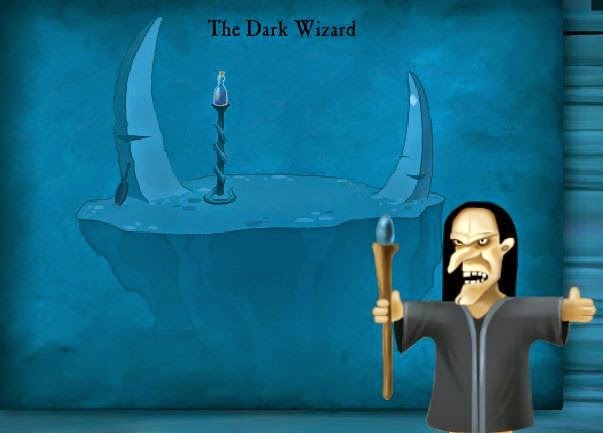 Now yo are at the Dark Wizard. Use Amber on the dark wizard. Use the mirror frame on the grove - wall area to the right of the bed. Pull the mirror frame. Take the mirror frame and pick up the piece of mirror that dropped. Go read the note on the wall. Notice a brittle brick on the top left. Take the 3rd mirror fragment. Make a Magic Mirror by combining the mirror fragments witht he mirror frame. Use the mirror on Amber. Combine the Alexir with the Amber puppet. 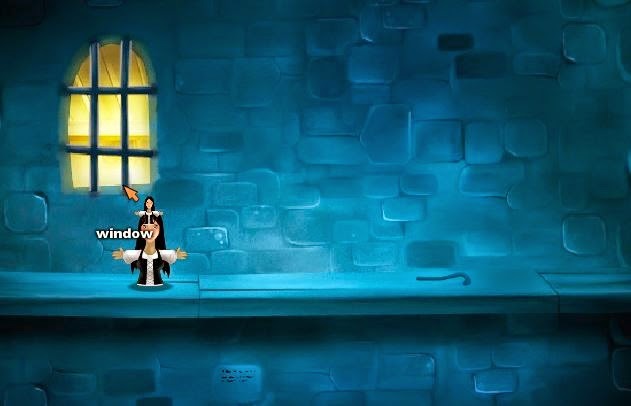 Use the Amber puppet on the window. Take the wand of fire. "In my hands, the eye look the moon... And the water shine with the sun and his fire "
Use the wand of fire on the candles. You now have a burning wand of fire. Use Amber puppet on the window. Use the amber wand of fire to see letters on the wall. 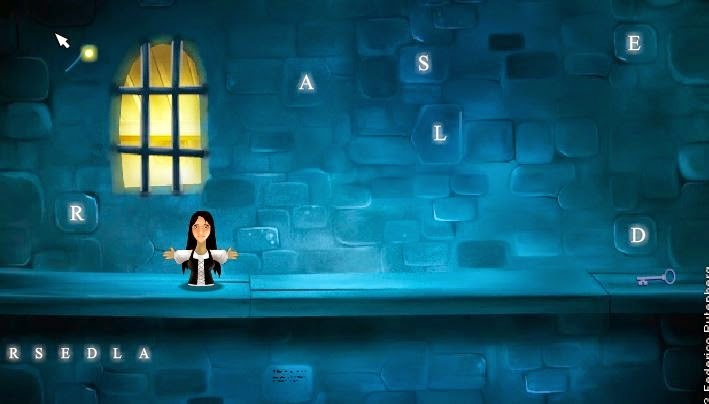 Now select the letters as per your note and the clues from the note inside the house. (each word = a letter. select the letters in the rigth order). Use the key to open the door!